Cash Flow Forecasting is the process of obtaining an estimate or forecast of a companys future financial position and is a core planning component of financial management within a company. It might sound obvious but the main output or deliverable of a cash flow forecasting process is a cash flow forecast. A cash flow forecast is a projection of an organisations future financial position based on anticipated payments and receivables. The process of deriving a cash flow forecast is called cash flow forecasting. • Covenant forecasting and half/ full year reporting visibility. • Interest and debt reduction. • Short term liquidity planning. There are essentially two main types of cash forecasting methods – direct or indirect. Direct cash forecasting is a method of forecasting cash flows and balances for short term liquidity management purposes, typically less than 90 days in duration. Direct cash forecasts often but not always include system based cash flows so as to make the cash forecast as close to real time as possible. 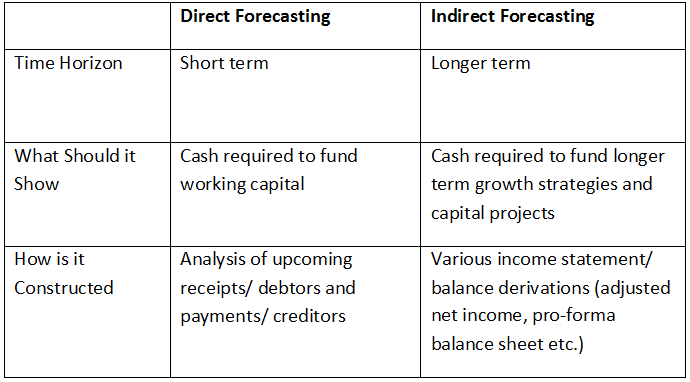 Indirect cash forecasting is often longer term in nature and it relies on various indirect methods of building up a cash forecast such as using projected balance sheets and income statements. In larger companies, the management of a cash forecasting process is controlled by the head office treasury or finance team. The work to be done in terms of assembling a forecast position generally involves sourcing data from both systems and people. The more complex an organisation, the more systems will contribute to the process, therefore it is critical to have the sources of cashflow data mapped and clearly defined. Although systems are important, it will be the buy-in and engagement of people that will determine how successful a cash forecasting process will be. Involving the people who will be accountable and ensuring their buy-in is a key factor for success particularly for direct cash flow forecasting. Receive our monthly roundup of whitepapers, blogs and product updates. CashAnalytics provides market leading software that helps treasurers to produce the highest quality cash forecasts and liquidity reports. Learn more.